Are Israelis safer than Americans? 41 days ago I returned to Israel after 26 years of exile in the US. Well, not exactly exile — We could have come back any time, as my wife reminded me often. So finally we did, and last week our possessions (we have too many) followed us, which is why my blog posts have been sparse for the past few days. We moved during the recent conflict with Hamas, and many of my American friends thought we should be anxious about the rocket barrages. I responded that there is always a quantifiable insecurity in Israel, because it is a small country with enemies on at least two sides. The key word is quantifiable. Israel knows who its enemies are and what weapons they have. We think — that is, we feel a degree of certainty greater than hope but perhaps less than complete confidence — that the IDF and the government have reasonable plans to deal with the threats from Hizballah, Hamas, Iran, Da’ash, etc. Maybe life here is more dangerous than life in the US — and maybe not. I know I had zero confidence in the US administration and its Department of Homeland Security to, er, keep the homeland secure. I keep reading about Hizballah activity in South and Central America and its close relationship to drug traffickers there. 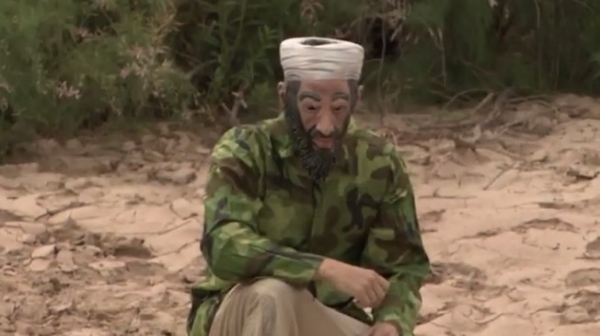 Then I see right-wing provocateur James O’Keefe sneaking across the border from Mexico wearing an Osama Bin Laden mask. It gives me pause. New York City remains a target, but one American organization that has been extremely serious about terrorism is the NYPD. Perhaps unfortunately, its aggressive undercover surveillance of Muslim communities has been curtailed recently for political reasons. It remains to be seen if this will turn out to be a fatal error, or if — as police spokespersons say — the new ‘open’ approach will be equally effective. In Israel there is a clear understanding that it is absolutely necessary to spy on Palestinian Arabs in order to prevent terrorism. Recently, after 43 reservists in an IDF intelligence unit signed a letter saying that they would refuse to perform surveillance duties that “harm innocent people,” the reaction in most segments of Israeli society was one of disgust. Of course it violates the privacy of Palestinians — but Israel doesn’t have the luxury of not doing this. I believe that the US thinks that it is big enough and powerful enough that it can afford to have lax border controls, to take elaborate care to never, ever ‘ethnically profile’, despite the threat of Islamic terrorism — not Jewish or Buddhist terrorism — that it faces, and even for the President to deny that the terrorists he wants to fight are Muslims. As everyone knows, airline security provided by the TSA in the US is a bad joke. Israel’s version selectively inconveniences some passengers, but is highly effective. In addition, El Al aircraft are fitted with $1 million systems to divert surface-to-air missiles. US airlines presently have no plans to install such systems, despite the fact that the terrorist world has been flooded with hand-held missile launchers from Libya. I understand that providing real security for the US, with its long borders, thousands of commercial aircraft, etc. would be massively expensive and an order of magnitude or two more difficult than Israel’s problem. On the other hand, the US has resources far greater than Israel’s. But there is no reason that the US has to insist upon the fiction that every person is equally likely to be a terrorist. There is no reason to insist on the fiction that the terrorists who are trying to kill Americans aren’t Muslims and aren’t motivated by their religious beliefs. So am I safer in America or in Israel? I am not really sure, and I don’t know how to answer the question scientifically. I do know that psychologically I feel more secure here in Israel, where we — despite the sometimes excessive self-criticism — take our enemies seriously enough to take real steps to protect ourselves against them. 2 Responses to Are Israelis safer than Americans? There is a dimension to insecurity in Israel that is lacking in American insecurity. It is the insecurity over the very survival of the state. The United States now that the Cold War is over has no such threat. This of course does not answer the question in regard to individuals. Perhaps the threats are greater in the U.S. on the level of dangers to the individual. Living in the U.S. and having had the privelege of visiting Israel at least once (so far), I can say that I felt much safer in Israel. Were it not for some complicating factors having to do with my particular family/life situation, I’d make aliya next week. Even when I was there in ’07, it was all I could do to drag myself through security to the plane coming back. As long as the nuclear threat from Iran is dealt with – the big “if” right now – I would submit that Israel is under no more of an existential threat than the post-Cold War U.S. No one besides a nuclear-armed Iran would have the means, and/or the will, to destroy Israel. And remember, Putin’s Russia still has hundreds if not thousands of nuclear weapons that can reach the U.S., and which still likely remain targeted on the U.S. U.S.-Russian relations are now the worst they have been since the end of the Cold War, and they are not likely to improve any time soon. (Interestingly, at the same time, Russian-Israeli relations – despite some obvious problems such as differences over Iran – are the best they’ve ever been). There are other theoretically existential threats Israel could face, but they are unlikely. Yes, Pakistan has nuclear weapons today, but she has had them for years, and these are mostly aimed at India. Pakistan is not going to bother with Israel; if she were intent on carrying out the kind of threat that Iran keeps making, she’d have done that by now. I understand that there is even some ‘under the table’ trade between Israel and Pakistan. There is also the danger that France or Britain, both with modern nuclear forces, could elect Moslems to lead their respective countries. The UK has already had a Moslem Vice PM, who just resigned over PM Cameron’s relatively mild support of Israel during the recent war. Further, there is the threat posed by Turkey, who, if Iran obtains nuclear arms – and thus destoys the NPT regime – is likely to obtain nuclear arms of her own. But unlike the Iranian mullahs – for whom the threat of Israeli retaliation is apparently not a deterrent – I consider it highly unlikely that a future Moslem-led UK or France, or a future nuclear-armed Turkey, would risk Israeli nuclear retaliation. None of these actors are that crazy or stupid. And what other threats are there? All of the countries on Israel’s frontiers are economic basket cases; not a one of them poses the sort of military threat that they did thirty or forty years ago, not even close. Egypt under Sisi is arguably more pro-Israel than the U.S. under Obama; Jordan isn’t about to attack (they seem to even depend on Israel to help defend against Syria); Lebanon and Syria are a total mess. Yes, there is Hezbollah, but I understand that they are now drafting 16-year-olds to fight; for all their bluster, they are being bloodied in Syria, and a full-out fight with Israel will likely be their death warrant. There is the political threat posed by the UN over the Palestinian issue, but that does not threaten Israel’s existence. Worst case scenario: Israel is expelled from the UN. But even if that happened, nothing would change on the ground. Like Taiwan – also not a member state of the UN – Israel would continue to function. Some worry about economic sanctions – and this might happen from some quarters, such as Europe and some Latin American states – but Israel is too integrated into the world economy for a serious sanction effort to materialize. No matter how hostile Obama may be, there is no way – no way, no how – that Congress would allow a U.S. boycott of Israel. In addition, Canada, Australia, Japan, China, India, South Korea, Singapore, Sri Lanka, and Columbia, and probably even Russia, all would continue to trade with Israel no matter what happened in the UN. Finally, just like the “Zionism = Racism” resolution in the UN, any action such as expulsion could and likely would ultimately be reversed under pressure from a post-Obama U.S. administration. As to the sense of threat faced at the individual level, there is no contest whatsoever, from the point of view of being Jewish. There are many, many places here in the U.S. where I would be risking serious bodily harm if I showed up wearing an IDF t-shirt, or with a pro-Israeli bumper sticker. With the exception of the issue of a potentially nuclear-armed Iran, I would say that Israel is stronger and more secure today than she has ever been. Wish I could be there with you, Vic, Shalom, and all of you other Israeli readers.